Life on the ISS depends on their energy budget. In addition to small quantities of fuel being transported consuming, primarily supplies the sun all life support systems and aggregates. The International Space Education Institute modified its power supply with the Jesco von Puttkamer school, the workshops and the Habitat (Space Hotel) on sun. So the young scientists get an idea of ? 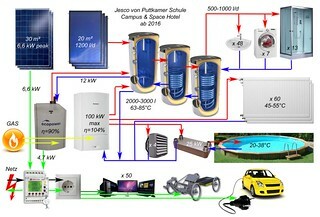 ?sustainable energy use. 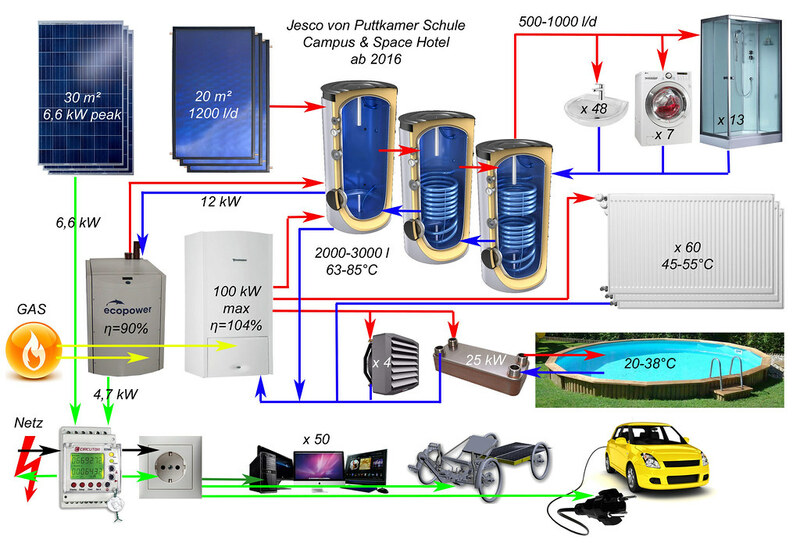 Thus, in future, the amount of energy used is produced to operate the "Jesco von Puttkamer school" and their departments themselves. Excess electrical power is fed into the network. Electricity consumption during the night will largely be refinanced. 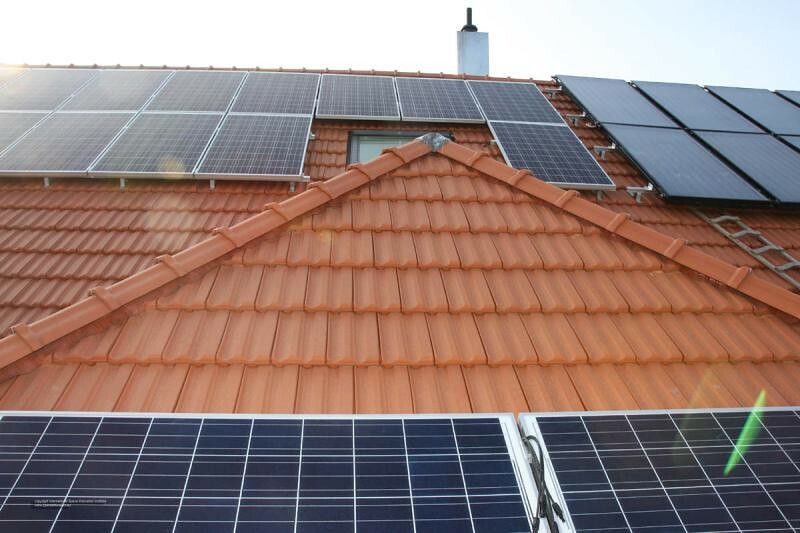 On very sunny days, excess heat from the solar thermal energy has to be dissipated. This is fed to a 2000 liter / 530 gal hot water tank for showering and washing. In the transitional seasons even bleigt left some heat for a basic supply of heating the rooms. Excess heat is dissipated in the summer to heat the outdoor pool (38°C / 100°F temperature in the pool are possible). On cloudy days and in snow adds a mini-cogeneration plant from "Ecopower" the energy-budget in the basement. This consists of a single-cylinder 4-stroke engine and is driven by natural gas. 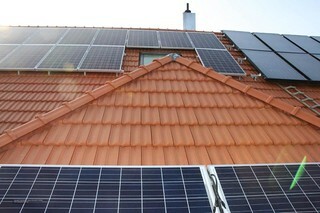 A generator replaces the complete power of the photovoltaic to 5 kW. In addition, it produces a fundamental requirement of 12 kW hot water to recharge the hot water tank and basic operation of the heater. So this powerstation adds 120 kWh electricity and 288 kWh for wamwater per day! The heating of all buildings on campus takes in the winter months, a natural-gas powered energy-efficiency heating of "Junkers" with a peak power of 100 kW. This benefit is especially important for the heating of the workshops on the Campus. An own subterranean district heating pipe ensures the transport of energy. So the steady weekly technical after-school-activities with students are now also possible in the cold months. Carger for the selfmade NASA-E-Rover and pugs for E-Cars on the Campus´ parking lot are in preperation. Thanks to Dr. Loeser from the company Dr. SOL Solarsystems in Leipzig (http://www.drsol.de).